iMacsoft DVD to MP4 Converter is a professional DVD Converter to MP4 and DVD to MP4 Converter especially designed for Windows users to convert DVD to MP4 format, such as MP4, AVI, M4A, MPEG4, DivX, XviD to play on iPad, iPad 2, the new iPad, iPad mini, iPad 4, iPod classic, iPod touch, iPod touch 4, iPod nano, iPod nano 5G, iPhone 3, iPhone 4, iPhone 5, iPhone 5S/5C, iPhone 6/6 Plus, PSP, Creative Zen, Zune, Zune 2, iRiver PMP, Archos AV500, Archos AV700, Archos GMini402, iRiver PMP-100, PS3, Xbox, etc. With this professional DVD to MP4 converter, you can also extract audio from DVD movie and convert DVD to MP3, AAC or M4A formats with excellent quality. 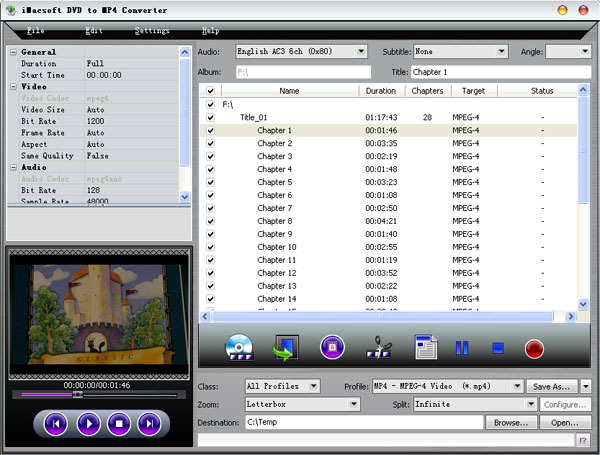 iMacsoft DVD to MP4 Converter provides a series of powerful settings. It lets you to customize file size, split output file, select audio track and subtitle, rip DVD audio clips and adjust video and audio parameters like bit rate, sample rate, resolution, frame rate, etc. Free download iMacsoft DVD to MP4 Converter to enjoy your favorite DVD movie and DVD audio clips on your MP4 players now!